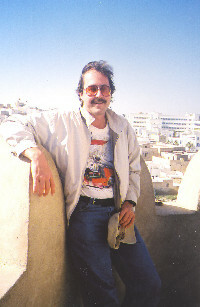 I’m Robert Raymond, writer and author, husband and cat-partner, model railroader and cyclist. I’m in my fifties, a resident of the bland city of Orlando (what’s the difference between Orlando and Yogurt? Yogurt has live culture). I commute to work by bike several times a week. I’m a founding member of an area model railroad club. I grew up in a Navy family, lived just about everywhere. I travel with my wife to such places as England, Scotland, Ireland, France, Tunisia and Italy. My favorite city is London, and my favorite spot is Hyde Park. Like everyone, I’d dutzed about writing in my early years, attempting to grind out that Great American Novel. In the nineties, I joined the Writer’s Room under Philip Golabuk. There I learned the discipline writers need (painfully so when I tore 80 pages out of my first true novel). I kicked out several short stories and novels and came close to winning minor awards. Finally I achieved writerdom (of sorts) when I wrote Don’t Jettison Medicine for Dr. Sister. Two years later, I lived the dream when Fire and Bronze was published by Ibooks. As fate would have it, Ibooks suffered catastrophic corporacide (its founder was killed in a car accident) – the company floundered and my royalties were lost. Even the rights were sold out from under me. But I’d been in print – I’d seen my book on the shelf, held it in my hands, been reviewed, gotten fan mail. Priceless! This did not diminish my writing – if anything, I’m generating work quicker and have several novels open for representation (agents, see the Agents Gate on the homepage). With a computer small enough to fit into my bike’s saddlebags, I can spend my lunch hours writing whatever catches my fancy. An hour’s writing balances a day in the cube. I’m constantly working at polishing my skills, trying different formats and formulas, looking to stories present and past for techniques and styles to work into my own written voice. Finding that perfect word that clicks a sentence shut with the razor-lock snap of a samurai’s kanana is a joy in itself. And nothing is better than discovering an author of greater skills and imagination – in life, one is a perpetual student, and a student always seeks his next master. I have yet to read Harry Potter. Professionally (a stretch) I am an administrator for a software team under Fedex’s Services Group. I only have a cellphone because I have to. It stays switched off.